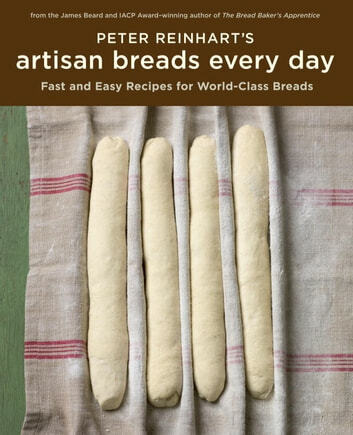 The renowned baking instructor distills professional techniques down to the basics, delivering artisan bread recipes that anyone with flour and a fridge can bake with ease. Reinhart begins with the simplest French bread, then moves on to familiar classics such as ciabatta, pizza dough, and soft sandwich loaves, and concludes with fresh specialty items like pretzels, crackers, croissants, and bagels. Each recipe is broken into "Do Ahead" and "On Baking Day" sections, making every step—from preparation through pulling pans from the oven—a breeze, whether you bought your loaf pan yesterday or decades ago. These doughs are engineered to work flawlessly for busy home bakers: most require only a straightforward mixing and overnight fermentation. The result is reliably superior flavor and texture on par with loaves from world-class artisan bakeries, all with little hands-on time. 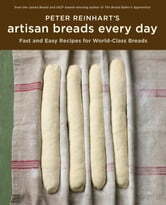 America's favorite baking instructor and innovator Peter Reinhart offers time-saving techniques accompanied by full-color, step-by-step photos throughout so that in no time you'll be producing fresh batches of Sourdough Baguettes, 50% and 100% Whole Wheat Sandwich Loaves, Soft and Crusty Cheese Bread, English Muffins, Cinnamon Buns, Panettone, Hoagie Rolls, Chocolate Cinnamon Babka, Fruit-Filled Thumbprint Rolls, Danish, and Best-Ever Biscuits. Best of all, these high-caliber doughs improve with a longer stay in the fridge, so you can mix once, then portion, proof, and bake whenever you feel like enjoying a piping hot treat.